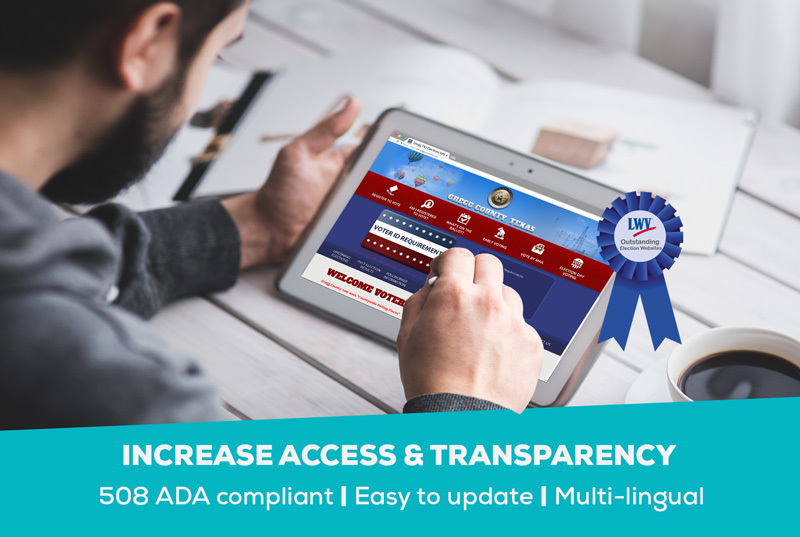 Improve access and transparency for your constituents with easy to update 508 ADA Compliant websites. Expand voter outreach through a custom web experience. Constituents can view sample ballots, and their precinct and polling location, and more. Allow our experts to create a professional design specific to your needs. Update and manage election, precinct, ballot info and more from one simple to use platform. Ensure new content quality and webpages before you publish to the world. Update your website content on the live site at the push of a button! The combination of Scytl Voter Education and Scytl Election Night Reporting has significantly simplified and reduced the burden we face in the days leading up to the elections and on Election Day. Scytl Voter Education helped our office provide our constituents a simpler way to find their voter information, [and] polling place locations. Combine Scytl Voter Education and Election Night Reporting for accurate and easy to update communication with constituents before, during, and after elections. Learn more about Election Night Reporting. Scytl has provided Online Voter Education in the United States since 2001. In the 2016 General Election, Scytl Voter Education provided U.S. voters with their voting information in counties in over 10 states, with more than 8 million registered voters.